On 25 August 2015, Ukrainian film director Oleh Sentsov was sentenced to 20 years of prison and anti-fascist activist Oleksandr Kolchenko to 10 years of prison. Human rights experts have called the case a “show trial of opponents” and likened it to Stalinist trials of the times of the most bloody repressions of the USSR. Here is the case in a nutshell. 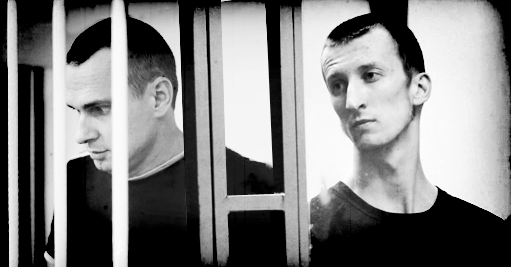 The accusations against Sentsov and Kolchenko are based entirely on testimonies of Henadiy Afanasiev and Oleksiy Chirniy, who were also arrested and charged with participation in the same “terrorist group.” Both Afanasiev and Chirniy have stated they were tortured by FSB, and after their “confessions” are facing the least possible punishment for terrorism, 7 years of jail, whereas Sentsov, the “leader” of the “terrorist group,” is facing 23 years. On 31 July 2015 Afanasyev retracted his testimony as given under duress. After that he was beaten again in prison. Sentsov and Kolchenko have stated repeatedly that they were tortured and beaten, and there is nothing to assume that the same didn’t happen to Chirniy. The trial being entirely based on forced testimonies, the alleged plot to blow up Lenin’s monument in Simferopol, Crimea, and the convoluted connection to Right Sector speak of a return of Stalinist show trials in Russia, according to Russian and Ukrainian human rights watchdogs. Memorial had declared Sentsov and Kolchenko political prisoners on 2 August 2015, explaining that the case been seen as political by human rights groups from the outset and accompanied by flagrant breaches of human rights and international law. Afanasiev was also enlisted as a political prisoner following his retraction of his testimony as given under duress. Both Memorial and Amnesty International have called for the charges against Kolchenko and Sentsov to be dropped. One thing that united the men was their staunch opposition to Russia’s annexation of their homeland, of which the United Russia party was an active player. Kolchenko, Chirniy, and Afanasiev admit to involvement to firebombing United Russia offices, but in all cases the acts carried no significant damage. There are numerous cases of arson of United Russia party offices and administration buildings across Russia. These are never charged as acts of terror, the perpetrators instead being convicted for hooliganism/arson and getting as little as two years in prison. Prominent European filmmakers, including Wim Wenders, Stephen Daldry, Agnieszka Holland and Mike Leigh and 2015 Oscar winner Pawel Pawlikowski, called on the Russian government to release Sentsov. The call for Sentsov’s freedom was joined by prominent Russian filmmaker Nikita Mikhalkov, Putin’s election agent during the 2012 presidential elections and a staunch supporter of the “Russian world”. 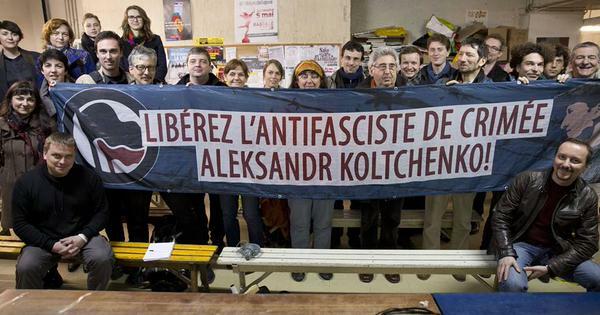 Anarchist groups across Europe and beyond launched a solidarity campaign with Oleksandr Kolchenko and held solidarity actions in Berlin, Bremen, Kyiv, Moscow, Minsk, Paris, Strasbourg and Warsaw.